I once read that Thai food is one of the most refined cuisines on the planet, and I am in complete agreement! Some years ago, I spent 2 months travelling in Thailand with my good friend Lou, a.k.a., the “Eating Machine”. This woman can eat! And so eat we did – all the way through Thailand. I remember one particular evening in a little beachside restaurant on Koh Samui. We sat at a table laden with dishes she had ordered. As she ate her way through almost the entire menu, the waiters looking on with wide – eyed amazement at my friend as she wolfed down one dish after another. Looking back on this epicurean adventure, I now realize how lucky I was to be travelling with my hollow-legged friend. I learned more about Thai cuisine in 2 months with her, than I would have, had I been travelling a year by my calorie-conscious self! The delicate marriage of Thai ingredients became firmly burned into my palate and has sent me searching for great Thai recipes to cook at home and share with friends, ever since. This recipe is pure Thailand and is now my favourite way to cook grilled chicken. A recipe in a must-have Canadian cookbook, “Whitewater Cooks at Home” by Shelley Adams, inspires it. I have added what my palate remembers of the exquisitely crafted dishes that I sampled on my trip to Thailand. I now share this with you in hopes that your dinner guests will cheer as much as mine do when they learn that I am making “that amazing Thai chicken” again. Place all of the ingredients for the marinade into a big bowl and mix well. Place the chicken thighs into a shallow baking dish and pour the marinade overtop. Make sure that all of the thighs are well coated with the marinade. Cover with plastic wrap and refrigerate for 2 nights. (Yes, that’s right – 2 nights!!) The thighs will be completely permeated with the flavour in this time and you won’t be disappointed! Turn the thighs after 24 hours to make sure that all surfaces marinate. Heat your grill to 400° F.
Remove the thighs from the marinade, and reserve the marinade for basting. Sear the thighs quickly on both sides on the grill. Reduce heat on grill to 300° F.
Grill the thighs slowly, turning every 2 -3 minutes, basting with the reserved marinade each time you turn the chicken. It will take approximately 25 minutes for the chicken to cook, depending on your barbeque. Check for “doneness” to avoid drying out the chicken. It should be fully cooked, but still moist. Some pieces may cook more quickly than others, depending on their size. Remove them while the other pieces cook. Place on a serving platter and garnish with the green onions and cilantro. I last served this chicken with delicious coconut rice and new carrots in a mint vinaigrette. Enjoy! This is amazing. THE most wonderful blend of flavours-delicious! Thanks Jacqui! So glad you like the recipe! Hope you get a chance to make it and serve it up to some hungry friends! They will love it! I made it just the other day and it’s awesome! Thanks, Chef! You’re welcome RC! Glad you like the recipe. That’s the fun of blogging isn’t it? We get to try out some tried and true recipes. Hi Liz. Sure, I have done it in the oven as well. The texture will be a bit different – more saucy and juicy, but it is just as delicious! I really hope you like it. Let me know. Oh, I love Thai making Thai food too!! It really is an awesome recipe. I hope you like it when you try it! Let me know! Thanks for taking the time to comment. Cheers! Mmmm, anything with coconut is high on my list! I hope you get a chance to try this and that you like it! Let me know what you think, OK? Oh, I’m so glad because this is one of my favourite summer time BBQ recipes! Thanks Chef Julianna! 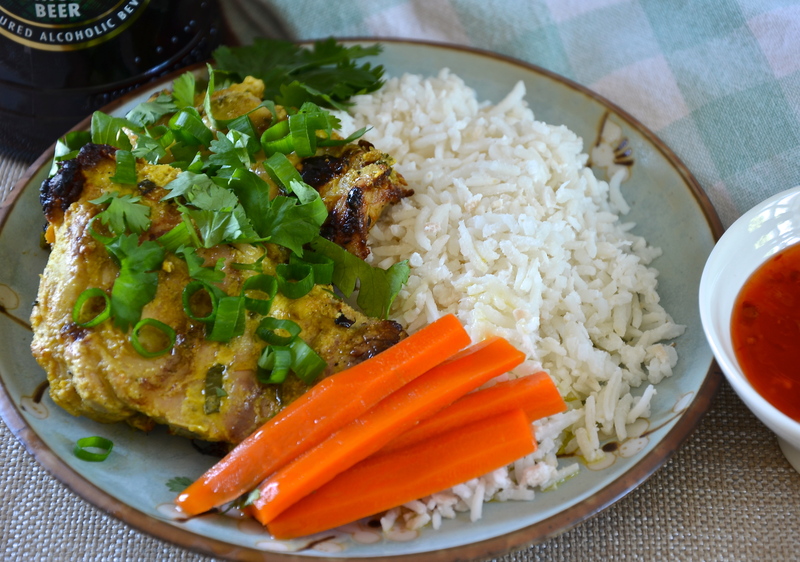 I made this fabulous Thai chicken the other night for our barbecue and it was such a hit! Gorgeous rich flavour! Thanks again!